I played Life—the board game—for the first time ever while down south visiting Firstborn and family. It wasn’t long before my nape early warning system went on high alert. The little hairs back there stood on end. If they were able to jump up and down, I believe they would have. I couldn’t put my finger on it at first, but my primal instincts were going bat guano crazy trying to tell me that something about that game wasn’t on the up and up. According to Wikipedia, Life was the first board game of its kind, created in 1860 by Milton Bradley, who designed it in the form of a checkerboard and named it The Checkered Game of Life. The checkerboard version of the game began in infancy at one end of the board and ended in “Happy Old Age” at the opposite end. Each player’s goal on the way to happy old age was to land on the good spaces and collect 100 points. Perfectly innocent, nest-ce pas? Certainly no cause for alarm. Flash forward to modern times and Life has changed considerably, updated and re-envisioned in 1960 as The Game of Life by Reuben Klamer and Bill Markham on the original game’s 100th anniversary. My subsequent research into the game of Life revealed that this game went through additional versions since then, each version taking on a more subliminally sinister direction and tone. Yes, folks. We are talking conspiracy—all out conspiracy. Balderdash, you say. Seriously? Well, I can prove it. Bear with me. 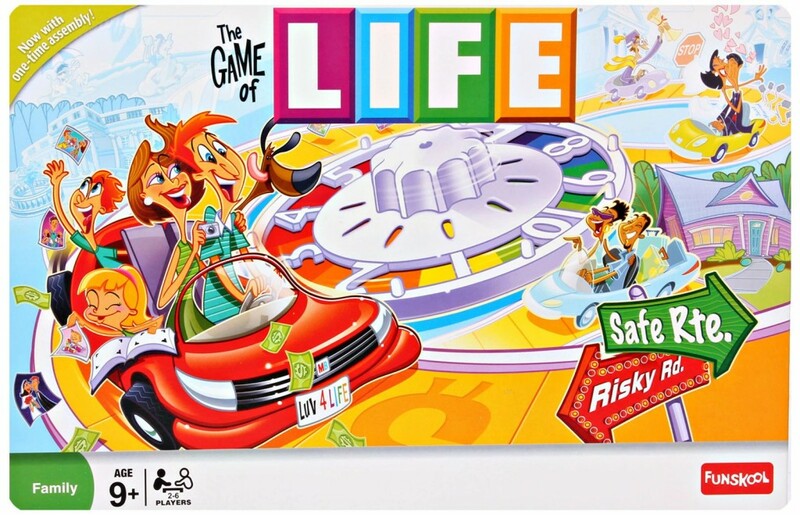 The modern version, now simply called Life, has the following features: a track (road) on which players travel through life by taking turns spinning for the number of moves (using a small roulette-type wheel at the board’s center that has numbered spaces 1 through 10). The board contains three-dimensional objects (tiny mountains, bridges, buildings, etc.). Playing pieces are small plastic autos in six colors, each with six holes in the top for inserting people pegs in pink or blue during the game as each player “gets married” and has or adopts “children.” There is also a bank setup that includes play money, a variety of insurance policies, promissory notes, and stock certificates. All that appears straightforward enough to the naked eye. However, appearances can be deceiving. Now we come to the heart of the matter: The Rules of Play. That is where I smell a rat. It is my contention that the modern versions of Life were modified with the premeditated intent to subvert capitalism, democracy, and freedom of choice. You are probably scratching your heads wondering how I came to that rather bizarre conclusion. Here’s the thing. Life is dictatorial and intractable. Life runs yours. You must choose your career path at the beginning: academic or job search, one or the other, you can’t try both. Once that choice is made, you’re stuck with it. Life will not permit you to change your mind and go in a different career direction—you can’t, even if your little plastic auto gets sent back to the start. Life also decides how much you may earn depending on the career space you land on in the beginning. There is no provision for salary increases based on initiative or merit. So where is the incentive to improve one’s lot in life? Life insists that you have to get married; no choice there. How’s that for tyrannical? There is no allowance for family planning or personal choice not to have children at all. If you land on a space that says you have a child or adopt a child, no choice—and no limit to how many. Like it or not, you have to become a parent. The Life version our family played contains the insidious “Share the Wealth” cards. Uh-Oh. Share the Wealth? That sounds an awful lot like Redistribution of Wealth, doesn’t it? Hmmm… Doesn’t that remind you of a certain economic and governmental system—one that is the complete opposite of free market capitalism and democracy? Like ::gasp:: socialism? I don’t know about you, but it is my considered opinion that those “Share the Wealth” cards in the game of Life are nothing less than a subtle form of socialist indoctrination. It’s so very insidious, but I caught onto it, thank goodness. Be cautious if or when you play Life. It’s not just a friendly board game any more. It’s a socialist snare that we have innocently deployed in our living rooms. The horror. That’s funny… I hadn’t looked at it that way, but I did learn early on, that going to college I could earn more money at a job than if I was a trade worker… now we are seeing in reality often the trades out pay the college kids who end up with a huge debt! You’ll have to check out PayDay and see what you think of that game! I agree, Melissa. I’ve paid plumbers and remodeling contractors more than I pay my primary care physician! I think it’s a Calvinist plot to make you believe in pre-destination!! !